HERITAGE HIGHLIGHTS: The remains of an 11th century palace favoured by Thomas a Becket. 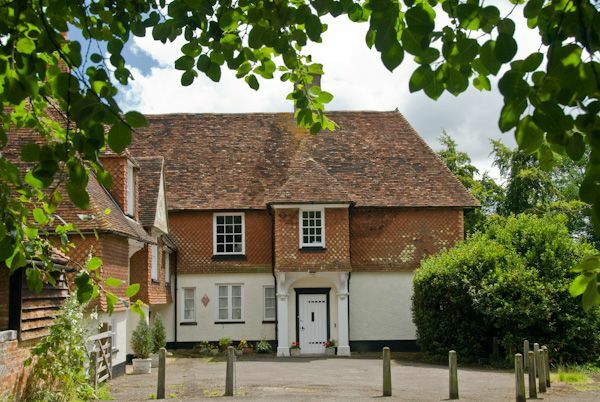 A small village of attractive cottages and the remains of an 11th-century palace used by the Archbishops of Canterbury. Charing was a stopover place on the major pilgrim trail to the shrine of Thomas a Becket at Canterbury. 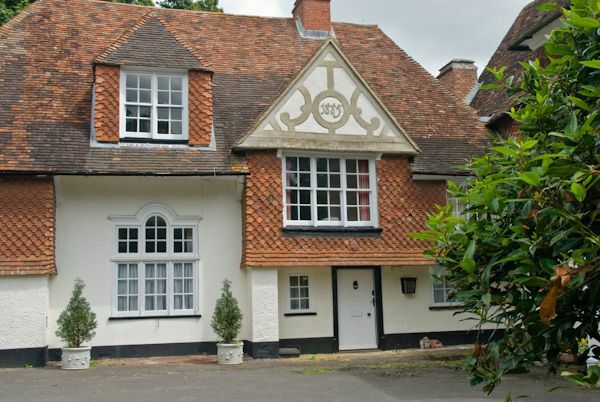 The village has a wealth of historic buildings, and these are outlined in a Village Trail leaflet put out by the Charing and District Local History Society, and available at a number of local outlets. In addition, there is a village tourist map detailing many of these historic buildings. Chief among these is the Bishop's Palace, used by the Archbishops of Canterbury as a stopping place between their residences in London and Canterbury. The palace is located behind a high wall just before the church. It was reportedly a favourite residence of Thomas Becket. He would not have recognised the present buildings, though; these date from the early 14th century. The very large great hall of the palace is now a barn, the top of which can be seen from the churchyard. The private apartments of the archbishop face the main gates which give onto the former market place. In an interesting historical touch, the Archbishop of Canterbury still robes in the Palace when he visits Charing. The parish church of St Peter and St Paul dates from the 13th century (chancel and nave), with the addition of transepts in the 14th century. The striking tower was added in the 15th century. 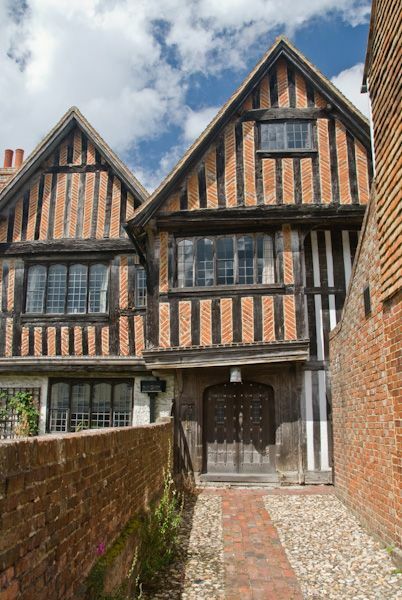 Tucked behind the church on Vicarage Close are two historic buildings, the oldest dating to the 14th century and thought to be the oldest building in Charing. The second building, the current vicarage, dates to the 15th century and was originally the church hall before being converted into a dwelling. 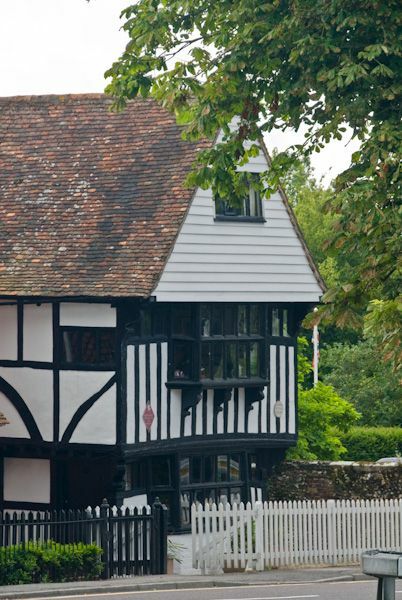 Closer to the High Street at Number 4, The Market Place is a half-timbered dwelling that was formerly the poor house. On the rear wall is a small window through which alms were given to poor travellers. Along the High Street are a number of fascinating historic buildings. The most interesting may be Peirce House (yes, that's the correct spelling). 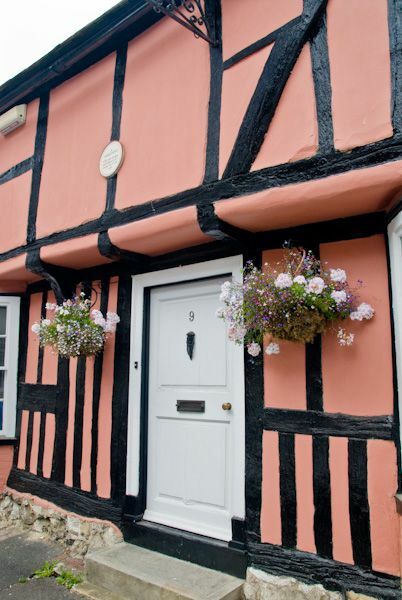 This is a lovely half-timbered house set back from the road behind a high wall. Over the door are the arms of the Brents and Nevilles, celebrating the 1501 marriage of Margaret Brent to George Neville, Lord Abergavenny. Another interesting building is Elizabethan Court, built in the 16th century. 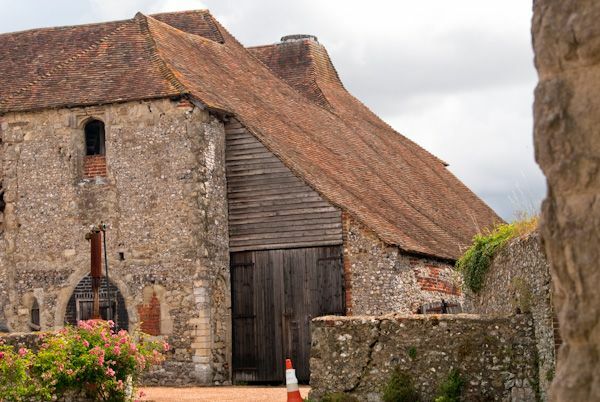 Originally timber, it was refaced in brick in the 17th century. 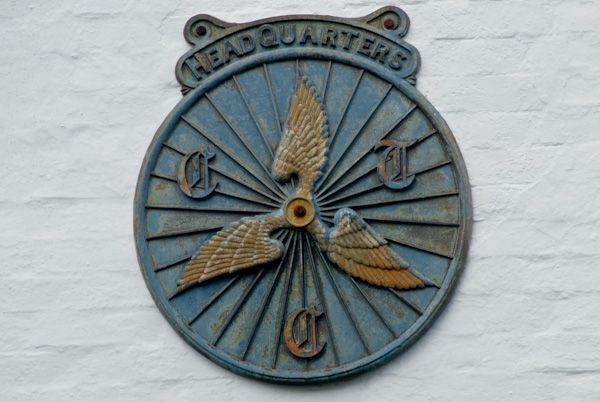 It was once a coaching inn called The Swan, and it still boasts the cast iron brackets that carried the inn sign. More modern is Venture Works, 20th-century home of the Cackett family, who invented the early motorcycle called the Invicta. 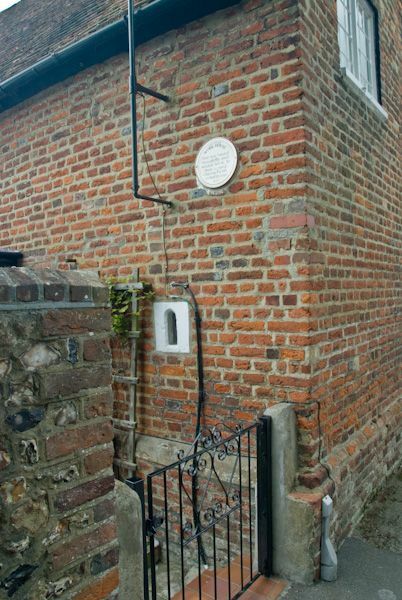 A very early petrol pump still stands outside the house. 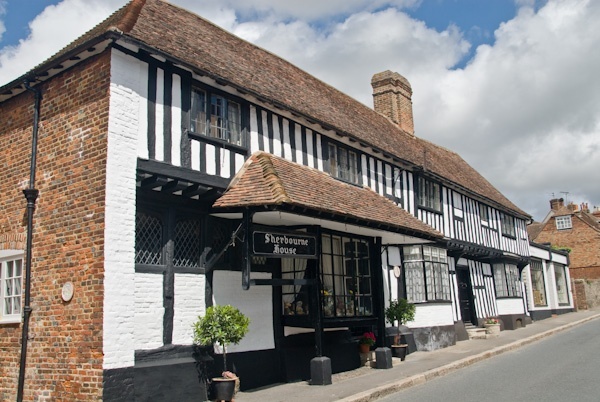 Across the A20 from the upper High Street is The Old House, a charmingly askew half-timbered building dating to the Jacobean period. This was once a poor house. 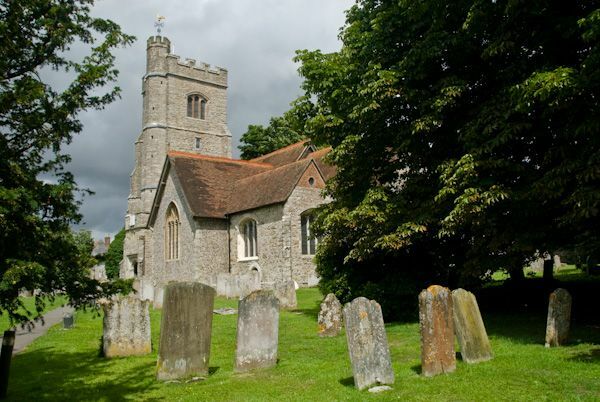 The village of Charing was granted to the Church of Canterbury in AD 765-80 by Egbert II, King of Kent. 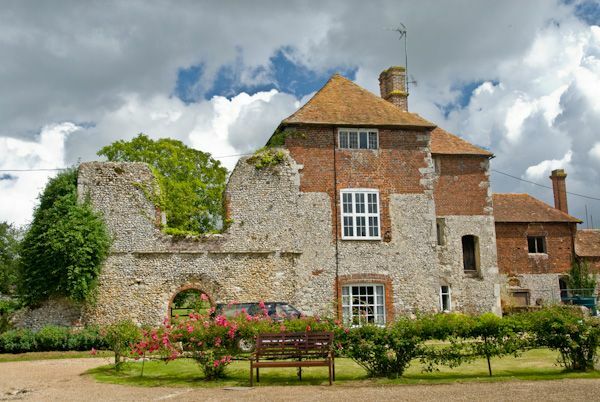 The manor of remained in the hands of the Archbishop of Canterbury until the Reformation.